*Integrate the new Love Our River campaign with the existing One State One River plan – Currently the JPS has a “One State One River” (OSOR) plan. The new LOR campaign must be synchronized and integrated together with the OSOR plan. Otherwise, different agencies will be doing different things and may even compete and argue with one another. The two programmes should complement one another rather than compete and overlap. Agencies responsible must sit down and trash out the different strategies, objectives and implementation. * Each state should have a LOR campaign – The new LOR campaign must not focus only on the most polluted or most beautiful river, or the rivers selected should not be arbitrary (or simply based on one agency’s recommendation). If a state does not have the OSOR plan, it should still have the new LOR campaign. * Franchising of the LOR Campaign – The new LOR campaign should be “franchised” in some states that do not have the agencies or capacities to run it. I have spoken with the Y.Bhg Dato’ Hj Keizrul Abdullah, DG of JPS regarding this idea before and he is quite attracted by it. The government should franchise the campaign to some NGOs with the capacity and expertise to run the campaign. Government departments must not be allowed to run it as they do not have the expertise in public awareness, public education or environmental education. * Public-Private LOC Partnership – If certain states do not accept the franchise idea, the other alternative is to form a Public-Private Partnership with inputs and contribution from government departments, private consulting or advertising companies, NGOs and local communities. There should be a bottom-up approach rather than the top-down approach. People must be empowered to run this campaign and feel like they own the river. If this feeling of ownership is absent, no campaign will succeed as more garbage will be dumped into rivers than what is taken out (by dredging). 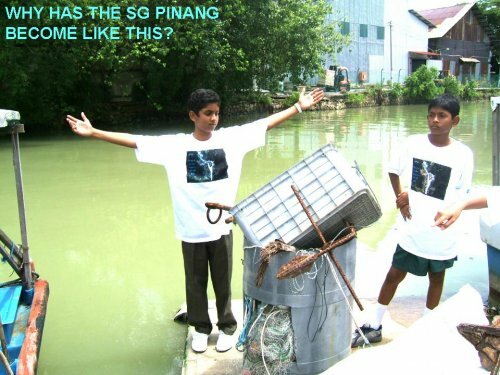 * River Education Centre (REC) – Water Watch Penang had proposed this plan ages ago when the Federal Government allocated some money to clean up the Sg Pinang. However, our idea of the REC was rejected as some feel it was too expensive and an NGO may not be able to run it. 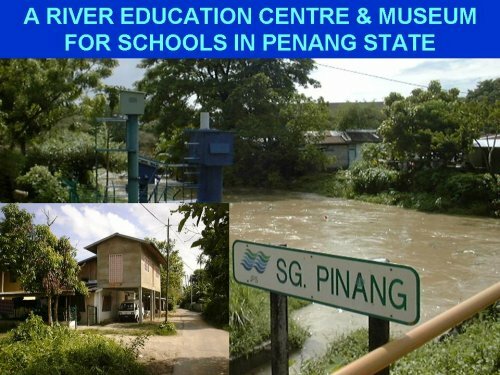 The idea of the REC is to look for a piece of land on the Sg Pinang banks, construct a building complete with river museum, water testing laboratory, lecture hall, video-viewing mini-theatre (to view river documentaries), canteen and toilet (for visitors and joggers, walkers using the river banks for exercise), bird watching, angling, and eventually when the river is restored to a good condition, rowing and other recreational activities. The REC can even be developed into a tourist attraction given the right facilities. Tourists can be given a sampan ride through the stretch that is deep enough. • GEOLOGICAL HISTORY including types of rocks and soils, and their formation. Whether or not there is groundwater below (this can be researched and made into a documentary). And how the geology has affected land forms and topography of the basin. • ECOLOGICAL DIVERSITY with vegetation communities ranging from equatorial rainforests to mangrove forests and other vegetation, and how these vegetation act as barriers against erosion and waves (e.g. coasts along Penang island with mangroves were known to have shielded fishing villages from the tsunami). Riverine vegetation types, and ages, of tropical forest to several types of rainforest as well as other shrubs can be studied and documented for study. A Model showing these vegetation types can be made on display at the REC museum. • ABORIGINAL HISTORY – If archaeologists make a study and find arcaheological settlements, tool scatters, quarry sites and shelters and remnant landscapes, these can also be on display and become an attraction. • HISTORY – A thorough history of Penang and the Sg Pinang can be documented and made available. Old ships used to sail into the Sg Pinang river mouth. Old houses and huts along rivers can be restored and become attractions. Flood adapted traditional Malay houses built on stilts can also be built along side the REC and these too show case our Malaysian culture and tradition. These houses must be built in the river or facing the river to enhance their beauty. Perhaps they can also be turned into homestays for toursists. • HYDRO-ELECTRIC DEVELOPMENT – some rivers large enough can document this aspect and a model on hydro-power generation can be on display. Perhaps even a model of the Bakun Hydro Electric Dam and how it works can be on display. • FORESTRY & FOREST MANAGEMENT PROCESSES – this can be shown and the Forestry Department, FRIM, WWF Malaysia and MNS can help here. • ROLE OF LOCAL COMMUNITIES – This can be show-cased if local communities have contributed in managing rivers. If not, we can always show case local communities in other countries who have been successful. * NEVER appoint Government departments with little or no expertise in public awareness and education to run the LOR programme. You cannot expect a department full of engineers to teach squatters not to dump garbage into rivers! * NEVER run the LOR programme with government funding. People will over-rely on the funding (like handouts). When the funding dried up, much the old LOR campaign also died a natural death. Seed funding is OK but to be sustainable, there must be some sort of sustainable funds perhaps from private sector, from local communities themselves or from funds raised with the help of government (perhaps issuing a River Bond?). In the case of the REC, we can charge visitors an entrance fee. The REC can even be privatized and run professionally like a museum. Private companies can contribute an annual amount and have their company’s names splashed on billboards, or they can support a small programme within the REC (for e.g. Company A sponsors rehabilitation of river terrapins, Company B sponsors restoration of wetland plants, etc). * NEVER leave the campaign without a LEADER. Lack of coordination amongst various responsible agencies led to the failure of the previous programme. There was no clear Lead Organisation. Often there were overlapping of responsibilities and often disputes arise. * NEVER put too much effort on “beautifying” rivers rather than doing the actual awareness, education and getting people to be actively involved. There was no sense of ownership amongst local communities living near rivers. As a result, when the government agency left (after organizing a LOR campaign) there was no continuity. * NEVER launch a programme half-heartedly. If the previous old LOR programme has failed, what makes people think the new LOR campaign worth only RM10 million will succeed? Just ask the relevant authorities how much was spent in the old campaign which failed. If the government is really serious, RM 10 million may be enough just for one state! If we want to go national, we need to multiply that amount with the number of states.